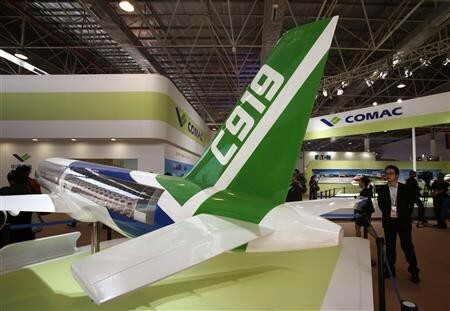 Since its launch in 2010, the Commercial Aircraft Corporation of China, better known as Comac, will make good on orders of China's C919 large passenger aircraft later this year, with the basic assembly of the aircraft already finished. The young state-owned aviation company's Monday announcement will be welcomed by the 18 customers that await the fulfillment of orders for 450 C919 planes. Comac's news emerged after deliveries of the C919's vertical fin and a portion of the rear fuselage were received by the aircraft manufacturer in early February. For this particular model, Comac has been able to rely upon partners within the domestic aviation industry for commercial-aircraft parts thus far. The model consists of 168 seats and 156 seat layouts, thereby allowing the C919 to compete alongside the two dominant names in global aviation, Airbus Group NV and Boeing Co., which form a duopoly in the medium-range aircraft sector. The C919 is a multibillion-dollar project and forms the basis of China's entrance into the global commercial-aviation industry. However, overseas buyers have been hesitant to enter into negotiations with Comac after its initial schedule was delayed. By November of last year, analysts cited 2018 as the earliest time that the world could expect to see the inaugural deliveries of China's first locally produced commercial jetliner. After its first plan factored in a 2014 launch for the first flight of the C919, followed by deliveries in 2016, Monday's announcement will be cause for the Chinese company's detractors to pause for a moment. The first C919 test flight is slated for this year, only one year later than initially anticipated. China-Owned London Taxi Company Will Build $300-Million Factory in U.K.
Has Alibaba's AFSG Finally Closed a Deal with Junzheng or Not?